But I just read a Wall Street Journal column about agriculture subsidies that has me so agitated, that I may change my mind and make the Department of Agriculture my top target for elimination. Here’s some of what Jim Bovard wrote. President-elect Donald Trump’s vow to “drain the swamp” in Washington could begin with the Agriculture Department. …Farmers will receive twice as much of their income from handouts (25%) this year as they did in 2013, according to the USDA. 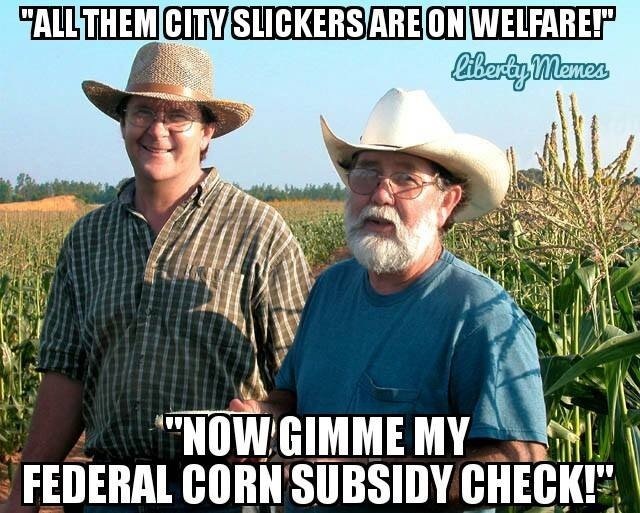 …big farmers snare the vast majority of federal handouts. According to a report released this year by the Environmental Working Group, …“the top 1 percent of farm subsidy recipients received 26 percent of subsidy payments between 1995 and 2014.” The group’s analysis of government farm-subsidy data also found that the “top 20 percent of subsidy recipients received 91 percent of all subsidy payments.” Fifty members of the Forbes 400 list of wealthiest Americans have received farm subsidies, according to the group, including David Rockefeller Sr. and Charles Schwab. …in 2015 the median farm household had a net worth of $827,307. That includes a great many residential, gentlemen and hobby farmers. The largest class of farmers—those who produce most farm products and harvest the largest share of the subsidies—have a median net worth of $2,586,000. By contrast, the median net worth for American households in 2013 was $81,200, according to the Federal Reserve. …as of March 31, 1.19 billion pounds had accumulated in commercial cold-storage freezers across the United States, the largest stockpile ever. …each American would have to eat an extra 3 pounds of cheese this year, on top of the 36 pounds we already consume per capita, to eliminate the big yellow mountain. …some farmers tried to limit the supply of milk by killing off their own cows. No, you read that correctly. This mysterious state of affairs was revealed in a nationwide class-action lawsuit against dairy cooperatives, groups of farmers who pool their supplies but, as a whole, serve as middlemen between the farmers and dairy processors. …The “herd retirement program,” as it was called, was led by Cooperatives Working Together, run by the lobbying group National Milk Producers Federation, and supported by farms producing almost 70 percent of America’s milk. …The path that leads to killing perfectly good dairy cows begins with a 1922 law, the Capper-Volstead Act. The statute was designed to protect both dairy farmers and consumers from profiteering middlemen. The real culprit here are federal peanut programs with an almost 80-year record as one of Washington’s most flagrant boondoggles. Subsidies have encouraged farmers to overproduce and then dump surplus peanuts on the USDA, which winds up stuck with hundreds of millions of pounds. That food has to go somewhere, and the department sees Haiti as the ticket. Food-aid policies have long been driven not by altruism, but by bureaucratic desperation to dispose of the evidence of failed farm policies. …The cost of peanut subsidies is predicted to rise 10-fold between 2015 and next year, reaching $870 million—which approaches the total farm value of the whole U.S. peanut crop itself. The USDA expects to spend up to $50 million a year to store and handle surplus peanuts, and industry experts are warning that federally-licensed warehouses might not have enough space to hold the next crop.